LENNY - 65 X 39.5 inches This drawing is an offshoot of the Butterfly works. Lenny was a character in one – the kitchen boss in a hospital. I actually knew a Lenny, who was my real-life boss at the Noble Hospital kitchen in Westfield, MA. He always played the lottery. In this drawing I was interested in the ways in which kids learn about how society operates through word-based math problems. My son, who is 9 years old, often brings home these types of problems, which are really convoluted and stretch their narratives to fit the mathematical problems being studied. Because of this, the problem’s stories are often based in everyday life but are very elaborately concocted. In addition, these math problems presume a form of moral behavior based of fairness and equality, usually through the capitalist exchange of money and goods. PROCESS: With this framework in mind, I decided to make my own math problem based on a working-class person’s desire / need to purchase a symbol of the higher class. As Lenny attempts to play the lottery and put his winnings towards the purchase of a new Corvette, his less apparent losses accumulate to negate these winnings. In the end, Lenny is at the same place where he started – his labor was fruitless and overall class stagnation clear. A zero-sum game. Visually, I wanted to pattern to vibrate like a lottery ticket might and to push and pull you optically. 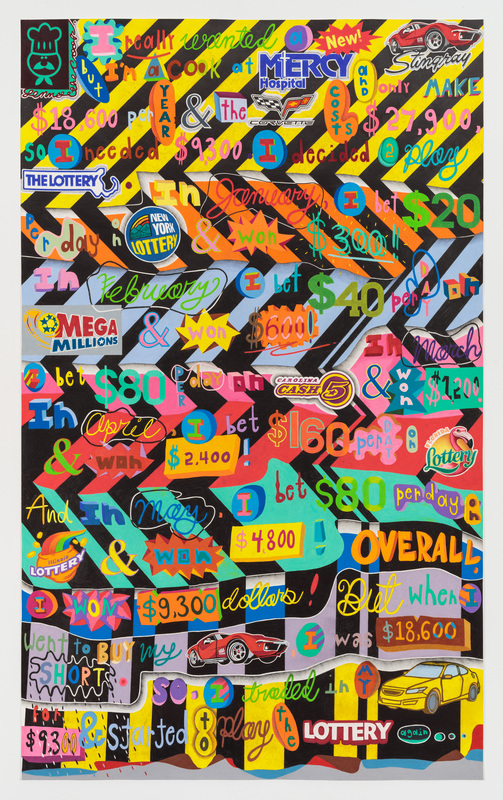 Each lottery logo is from different state, which, if connected, would form a map of states associated with the perils of the lottery as a means of class suppression. I think it’s funny but also sad - like tragic humor.